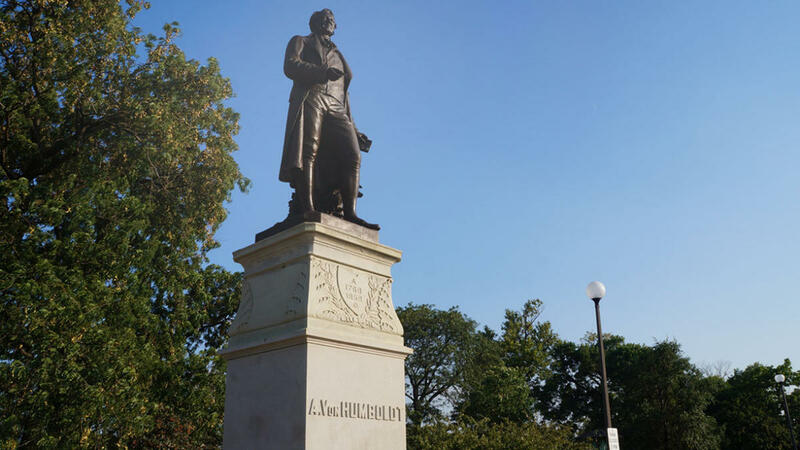 This monument pays tribute to the park’s namesake Alexander Von Humboldt (1769-1859), a naturalist and explorer from the Kingdom of Prussia, an area that is now northern Germany. Born in Berlin, Von Humboldt made extensive explorations in Latin America, Russia and Europe and his work contributed to studies in meteorology, geography, ocean currents and magnetism. Donated by a local German brewer, Francis Dewes, the artwork was sculpted by Felix Gorling. The bronze figure of Humboldt is depicted holding a book. This represents Cosmos, his famous five-volume series. At Humboldt’s feet, the sculpture also includes a globe and iguana. These symbolize his trips to the Amazon to study plant life, and Siberia where he studied ocean currents.